To me, winter is for warming desserts. 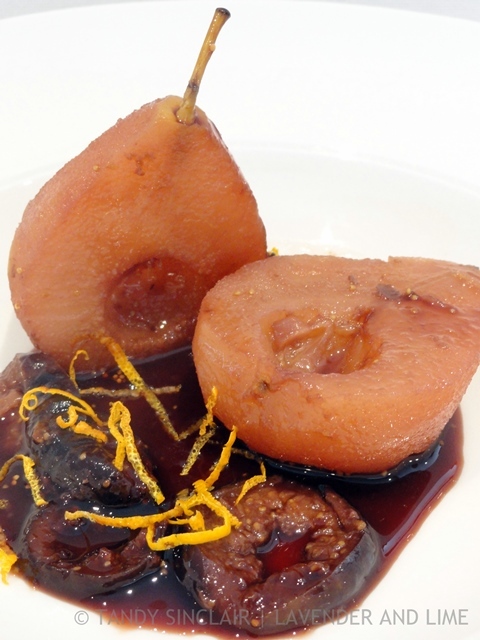 Spiced poached pears are perfect and served with the syrup make for a great ending to a meal. During the week my breakfast consists of 2 apples. I might change this for other fruit in season. But I always start my day like this. Last week Dave and I went out for lunch. We ordered a bowl of pea and ham soup each. It was a huge portion and came with a slice of toast. I had an appointment at 14h00 and went to gym after that. Usually the first thing I do when I get back from training is have a snack of some sort. This is to fill the gap between exercise and pre-dinner snacks. But I was not hungry when I got home, and so I didn’t have anything to eat. Dave got home and prepared our usual platter. We sit down with a whisky and nibble on pickled onions, pickled cucumbers, cheese and/or biltong. Some nights Dave adds crackers with a topping to the choice. No sooner had he placed it in front of me that I ate my way through my half of the pickles, and the crackers. I mentioned how hungry I must have been and had one piece of cheese before getting up to feed the dogs. By the time I got back, Dave had finished the cheese, leaving me with a little bit of space in my tummy. I made dinner, snacked on fresh green beans and put dessert on to cook. 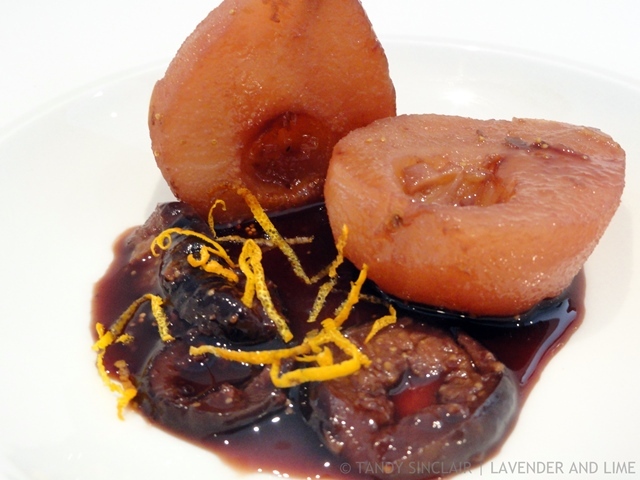 Spiced poached pears were the perfect way to end our meal, and left me feeling quite satisfied. Which fruit do you like to poach? Another wonderful tasty recipe! The pears look just WAW!!!! I have never eaten poached fruit, Tandy. I am not much of a sweet person but this does look and sound very nice. Hope the sun comes back though! yes, i love cooked pears for winter desserts! i usually roast them with a bit of cinnamon and serve with stilton cheese + toasted walnuts. Tandy, this sounds so delicious! Hugs. These would be perfect here today Tandy! Although it’s not winter, it’s pouring rain and spiced desserts seem ideal for today. Thanks for sharing. Rain is no fun, no matter how cold. Stay indoors and dry. Never though to add figs – must add great texture.